Lake Erie Beach Vol. Fire Co. "Number 4"
Lake Erie Beach #4, after 30 years of service, is no longer in our possession. 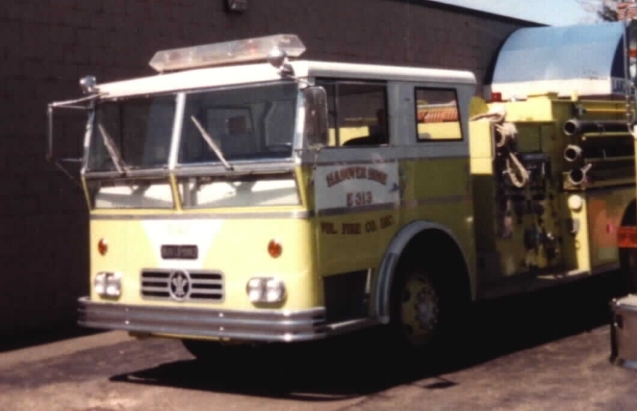 This 1967 Ward LaFrance 1000GPM Hale 750Gal pumper is now in service with Hanover Center. Upon delivery of our 1997 Spartan/RD Murray Custom pumper (Lake Erie Beach #1) in December of 1997, L.E.B. #4 was taken out of service and was donated to our fellow firefighters of Hanover Center. L.E.B. #4 was our attack pumper right up until delivery of our 1993 Spartan/RD Murray pumper (L.E.B. #3). Lake Erie Beach #4 seats three firefighters in the enclosed cab including the driver with a bench seat for two. There is also two semi-enclosed rear facing "jump-seats", each with an integrated SCBA pack. Those inside can communicate to those in the "jump-seats" via the sliding rear window of the cab. On April 25, 1998 Lake Erie Beach #4, er.....Hanover Center #E513 returned to Lake Erie Beach for the dedication of #1, its replacement. Trucks from neighboring companies lined up at 12:30pm in the parking lot of our station. At 1:00pm the dedication began with a small ceremony and than concluded with the traditional "dousing" of the new apparatus by all the other vehicles in attendance. This was followed by a small meal presented by our Ladies Auxiliary and tour of all of our other apparatus and our station. Refreshments were available at this time inside of the station.